When I woke up this morning, I knew it was finally the first autumn day we've had! There is a low coming down from Northern California this weekend. Clouds are forming. It was a crisp, clear, cool morning this morning. According to our local news, this weekend will be a "clothes changing" weekend. That means it's time to get out our winter clothes, a low front is moving in! Rain is expected here in the desert. I need to toss out my African daisy and California poppy seeds in my front yard. They always sprout after the first desert rain! This is a photo from a couple of winters ago taken near the north side of Mt. 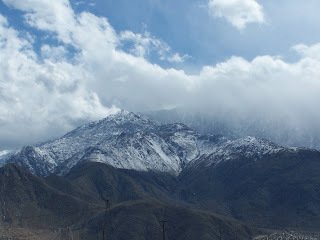 San Jacinto, also called the "north face", north of Palm Springs, CA. Aren't the clouds pretty? I will enter this in Skywatch today, my first photo! I enjoyed your photo. Welcome. Welcome. That really is a stunning shot to start off with. Wonderful shot of the clouds and mountains tipped with snow. Nice shot of the mountain...Thick fog too. wonderful first sky watch photo! I hope you keep coming back! A very lovely photo for SkyWatch! Yes, the clouds are beautiful! We've been experiencing "clothes-changing" weather around here, too. It was very chilly at our football game this evening! I was glad to get home. Your site must have been one I could not access last week, a pity since I really love this snowy mountain. Your Bobcats below are adorable and so well photographed, I'm impressed.